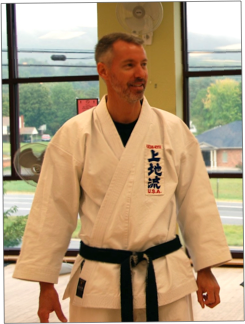 The Roanoke Okinawan Karate School offers instruction in traditional Okinawan Uechi-Ryu Karate. Classes are designed to develop and improve self-discipline and confidence in children and adults of all ages. Doug and Susan Bleecker guide each student to their personal goals. They make learning fun and practical. For more information please contact the Bleecker's at mrdougbleecker(AT)yahoo(DOT)com or call 966-3439 . The Roanoke Okinawan Karate School holds classes at the Botetourt Carilion Wellness facility. MEMBERSHIP TO THE CLUB IS NOT REQUIRED. The classes are held upstairs in Studio I and Studio II. Check in at the front desk before you come in for class. We look forward to seeing from you! Created by Brandon Wagner. Contact him at brandon AT brandonwagner DOT info.